We finally managed to dig our way out after the "Blizzard of 2011." 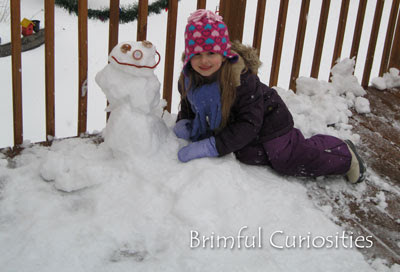 No pictures of that, but my daughter made a little snowman all on her own this past weekend on our deck. She was very proud. Luckily, since the deck is higher up in the air, the snowman didn't get covered up with mounds of snow. The snow blew right off, due to the high winds. Our driveway, on the other hand, had some pretty big drifts! And, just a little update - I haven't been feeling the best this week and haven't felt much like posting. Plus, the little guy is recovering from an ear infection. Hope we'll all be back up to speed soon. Sorry for the lull! Happy Groundhog's Day & Chinese New Year! I hope you feel much better soon and so does little man. such a cute little snowman! We have snow, but didn't get all of the blizzards over here in Pittsburgh. This time last year we got hit hard with "Snowmeggdon 2010". Wondering if it's going to show up this weekend for the Superbowl.